Hey friends. Need a end of the year pick me up? Or – oh dang I have to work all summer – pick me up? I made some Angry Bird Conversation Starters! These were super easy so I think you can make them with just a few minutes of prep! The cube is a free download available here. 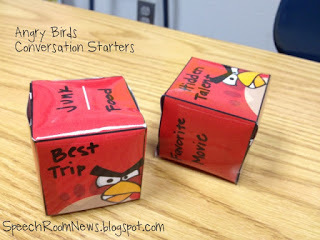 I printed them in color and just used a marker to write some conversation starters on the cube. If you plan to re-use them, laminate them. 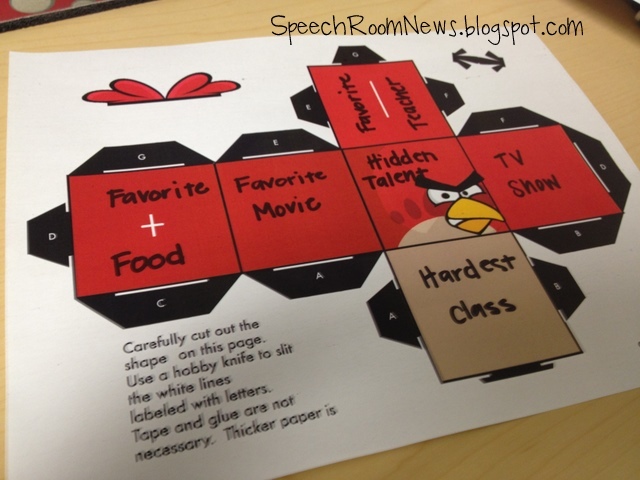 Just cut them out, and use them as a quick convo starter at the beginning of your social groups! I think it goes without saying that you could use this for any goal! very cute…I downloaded it removed the color in Photoshop and printed out I am letting the kids color them. This is awesome! It will make an die game more enticing! You have such awesome work, I’m sure your kids love you! Can’t wait to print it at home! I was able to download some pdfs for additional birds… ’cause I just know my kids will ask for their favorite bird! I am a fan of cubeecrafts and almost everything papercraft related, but this is the first time I have seen someone use them in that way. Love your blog and all of your materials…been following, pinning, and using your ideas and freebies a LONG time…wanna say 2011, I know it was before you opened your TPT store. Love the TPT materials too, use my candyland cards a bunch. Just going through my pins and finding lots of treasures that I had forgotten about! Thanks Janie! I love finding old pins and resources! Thanks for stopping by!